BeethoveN ransomware virus is created to encrypt valuable user data and extort victims for a ransom fee. All files that have the .BeethoveN file extension are affected and no longer workable. BeethoveN virus is based on the HiddenTear source code and copies its behavior. 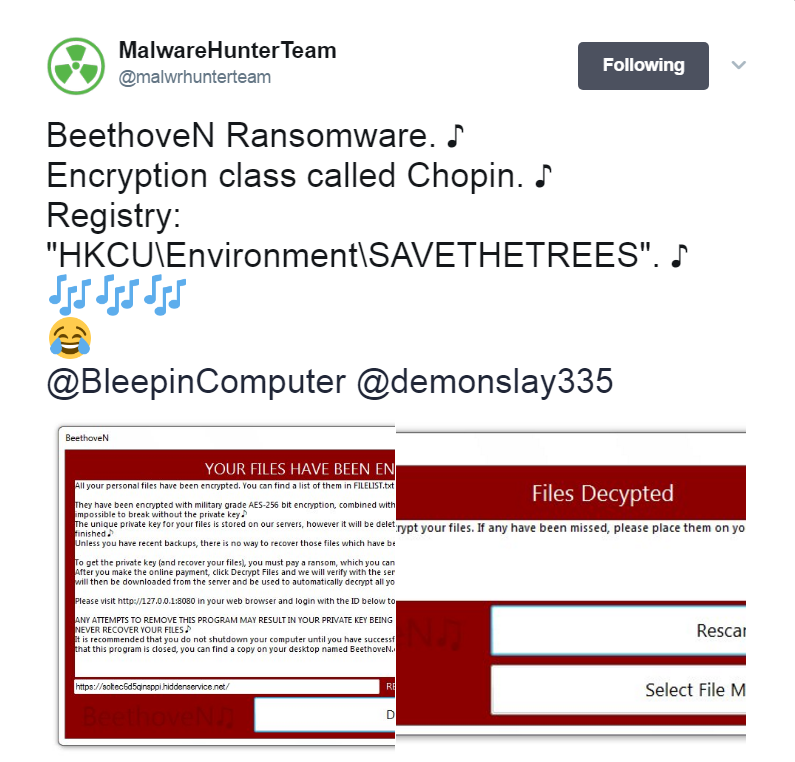 So the good news is that security researchers have managed to crack the code of HiddenTear ransomware and the freely available decryption tool may help victims to recover .BeethoveN files. But first, all BeethoveN malicious files should be removed from the infected PC. 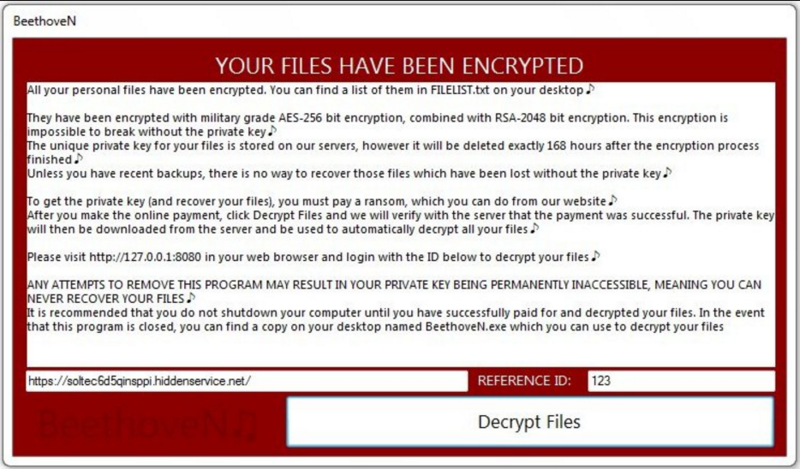 BeethoveN virus is a data locker ransomware that utilizes strong encipher algorithm to modify the original code of predefined files so they cannot be accessed until a ransom fee is paid to criminals. They possess the unique decryption key that once employed is believed to decrypt all .BeethoveN files. Don’t rush to pay the ransom, the key may not be working or missing at all. Furthermore, there are alternative data recovery solutions. Let’s reveal more details about the infection flow. It all begins with the execution of a malicious file called BeethoveN.exe dropped on the desktop folder. The file can start a sequence of malicious activities that infect the operating system and targeted data. First, it initiates a scan process of all drives to find files that belong to its predefined target data list. The list may include commonly used file types as they usually contain sensitive information. Thus documents, images, photos, archives, videos, music, text files are likely to be corrupted and renamed with the .BeethoveN extension during the ransomware virus infection. At the end, BeethoveN crypto virus drops a ransom note to inform victims about the infection and provide further details how they are expected to act if they want to recover affected files. What our team has noticed during our research is the witty humor of security researchers at MalwareHunterTeam. We have noticed a post on their Twitter account which presents BeethoveN ransomware virus with catchy text written in the BeethoveN spirit. Hopefully, they will crack BeethoveN code soon, and all victims will be able to decrypt all .BeethoveN files. BeethoveN virus payload is likely to be distributed via spam emails whose sender may pose as a legitimate source. The text, on the other hand, may be trying to convince you that the file attachment should be urgently opened. Beware of file PDF attachments that contain embedded word files as it is a standard distribution practice used by crooks. This technique allows them to obfuscate the malicious payloads of the threat in malicious macros embedded in the word document. The threat itself may also be distributed through links that lead to compromised websites. Except in emails, such links may be presented in messages or posts on social media sites like Facebook and Twitter. WARNING! Manual removal of BeethoveN ransomware virus requires being familiar with system files and registries. Removing important data accidentally can lead to permanent system damage. If you don’t feel comfortable with manual instructions, download a powerful anti-malware tool that will scan your system for malware and clean it safely for you. WARNING! All files and objects associated with BeethoveN ransomware virus should be removed from the infected PC before any data recovery attempts. Otherwise the virus may encrypt restored files. Furthermore, a backup of all encrypted files stored on external media is highly recommendable. NOTICE: As BeethoveN ransomware is believed to be a HiddenTear variant, all of you who are victims of the threat can try to recover data with the freely available HiddenTear decryption tool developed by Avast specialists. You need to have at least one original copy of a .BeethoveN encrypted file which may help the decryption tool to get the decryption key. Afterward, the same key may be used for the rest .BeethoveN encrypted files. You can find more details how to use the decryption tool in the guide uploaded on No More Ransom website. In case that .BeethoveN files cannot be decrypted with the HidenTear decryptor, you can try the following alternative data recovery solutions.